Retired Los Angeles Auxiliary Bishop Juan A. Arzube, among the country's first Hispanic bishops ordained in the post-Vatican II era, died Dec. 25 in Los Angeles. He was 89, and had lived at Nazareth House in West Los Angeles since 2002. A funeral Mass was celebrated Dec. 31 at the Chapel of the Risen Christ at Holy Cross Cemetery in Culver City for Bishop Arzube, the second Hispanic bishop ordained in the U.S. (after Auxiliary Bishop Patrick Flores of San Antonio) when he was made a Los Angeles auxiliary in 1971. His involvement with various issues in the church and in the community prompted new outreach to Hispanics in the Los Angeles Archdiocese. Auxiliary Bishop Juan Arzube enjoys a retirement celebration in his honor May 23, 1993 at St. Vibiana's Cathedral. 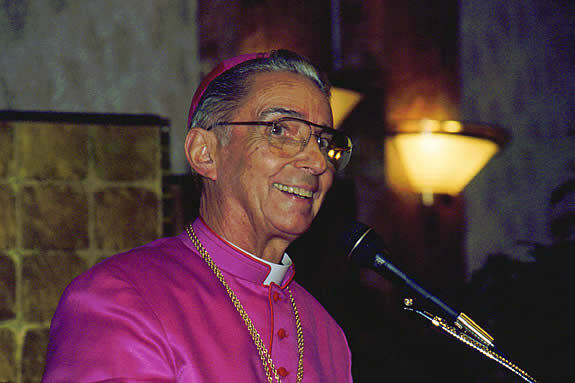 Bishop Arzube died Dec. 25 at age 89. During his 53 years as a priest, Bishop Arzube served primarily at parishes in Los Angeles and other Mexican-American communities. He was active in assorted efforts to assist immigrants, supervised the erection of a shrine at Our Lady of Guadalupe, a mission church in El Monte where he served, and supported the creation of the Episcopal Commission of the Alta Baja Bishops, for bishops from U.S. and Mexican border states. "He was very beloved by all peoples across the Archdiocese, and especially by the poor and those without voice or power," said Cardinal Roger Mahony, who presided at Bishop Arzube's funeral. "They saw him as their Good Shepherd, caring for them, nourishing them, and guiding them. His many ministry initiatives for the good of people will continue to live and flourish for years to come." Auxiliary Bishop Gabino Zavala --- who succeeded Bishop Arzube as San Gabriel Region bishop in 1994 --- gave the homily. "Bishop Juan saw that faith and politics could not be like oil and water. They must come together," said Bishop Zavala. "He knew that if a people's physical well-being was negatively affected by what was happening in their local neighborhoods, so was their spiritual well-being. Preaching the Gospel meant taking action and getting involved. Shepherding meant taking the lead." Bishop Zavala noted that Bishop Arzube invited the Industrial Areas Foundation to work with faith communities in East Los Angeles "to name the ills that beset them, to identify, call forth and train leaders, to demand the attention of political and economic leaders and to insure reform." People of Our Lady of Guadalupe Mission, El Monte, bid farewell to Fr. 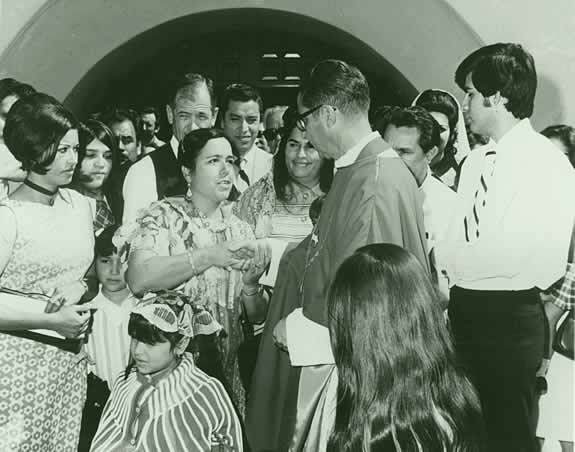 Arzube in March 1971, after their administrator was named an auxiliary bishop for Los Angeles. Upon Bishop Arzube's retirement in 1993, speakers at a tribute dinner described his trailblazing advocacy on behalf of Hispanic Catholics. At that event, Cardinal Mahony said Bishop Arzube's work for Hispanics in those early days was not greatly supported around the state. "His visionary efforts and the direction he brought to the church were vital, timely and needed for the good of the church," Cardinal Mahony said. A native of Guayaquil, Ecuador, born June 1, 1918, Juan Arzube was the son of Dr. Juan B. and Maria Arzube. His father was a surgeon, educator and philanthropist who worked for the children of impoverished and working mothers. The future bishop lived for a while in England, before finishing high school and college in Ecuador. He received a civil engineering degree from Rensselaer Polytechnic Institute in Troy, N.Y., and worked in Ecuador as an engineer. He moved to Los Angeles in 1944 and went to work in motion pictures and radio, dubbing voices in Spanish for Warner Bros. and Disney studios (he voiced the fox in "The Song of the South"). The Internet Movie Database lists a small acting role he had in the 1946 classic, "The Razor's Edge." A longtime acquaintance from their shared community activism recalled hearing Bishop Arzube once demonstrate his knack for imitating the voice of actor Peter Lorre, whose roles he had dubbed into Spanish years earlier. On retreat at Serra Retreat House in Malibu, he discerned God's will in his life and decided that his talents could be put to good use in the priesthood. He entered St. John's Seminary in Camarillo, relatively late in life for those days, and was ordained May 5, 1954 at the age of 36. "I am a late vocation," he said in a 1971 article in The Tidings. "I believe persons being called by God should go when they are called. The late vocation appreciates the difference between pleasure and happiness." 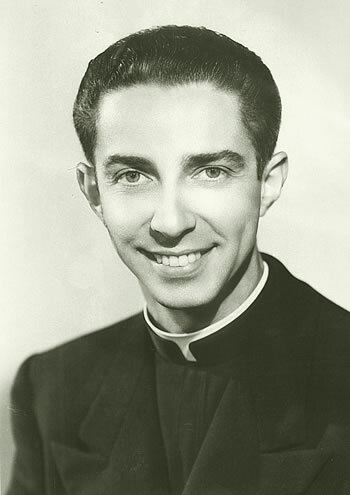 Father Juan Arzube was ordained a priest at age 36 in 1954. Ordained by Cardinal James Francis McIntyre at St. Vibiana Cathedral, he served as associate pastor at St. Agnes Church, Los Angeles (1954-56); Resurrection, L.A. (1956-60); and Nativity, El Monte (1963-68). He was administrator at Our Lady of Guadalupe Mission, El Monte for three years until appointed auxiliary bishop in February 1971. In accord with custom at the time, Bishop Arzube served as pastor, St. Alphonsus Church, East L.A. (1971-1981) while also serving as episcopal vicar to the Spanish speaking. When Cardinal Mahony created the five pastoral regions, Bishop Arzube headed the San Gabriel Pastoral Region from 1986 to his retirement in 1993. He lived in residence at Sacred Heart Church, Altadena, before moving to Nazareth House. Within the U.S. bishops' conference, Bishop Arzube served on committees dealing with Spanish-speaking people, the Catholic Campaign for Human Development, domestic and international policy, the church in Latin America and the National Advisory Council. Bishop Arzube was recognized as a leader in numerous fields for his contributions in religious as well as civil endeavors. He received the John Anson Ford Human Relations Award, the Mexican-American Opportunity Foundation's Humanitarian Award and the Campaign for Human Development's Empowerment Award. In a tribute to Bishop Arzube posted on CubaNews, an Internet news group, Rosalio Muoz, a community organizer for various organizations since the 1960s, recalled working through ecumenical groups with the bishop on workers' rights, immigrants' rights and other causes. He told of a "posada" procession one Christmas season that brought a candlelight protest to various government office buildings, to the detention center for immigrants awaiting deportation, and to the post office to mail thousands of letters to the White House. "I remember I had to hold back in starting the march as the bishop arrived about a half-hour late," Muoz wrote. The bishop explained that he'd had to justify his participation in the event to the archbishop. "Looking behind us I saw hundreds and hundreds of moving, flickering candles coming with us," Muoz wrote. "I said, 'Juan, I don't think you have to worry for now.'" Bishop Arzube's family background also included a saint. A cousin, Christian Brother Miguel Febres Cordero, was canonized by Pope John Paul II in 1984. One of the Christian Brothers' first pupils in Ecuador, Brother Cordero was born in 1854 and entered the order at age 14. His teaching career lasted 32 years and his textbooks on grammar and linguistics were adopted for use by the Ecuadorian government. The Mass of Christian Burial for Bishop Arzube was held in the Chapel of the Risen Christ at Holy Cross Cemetery in Culver City. Entombment took place in the mausoleum at the Cathedral of Our Lady of the Angels Jan. 2. Contributing to this story were Hermine Lees and Catholic News Service. Any original material on these pages is copyright BishopAccountability.org 2004. Reproduce freely with attribution.